Cheap Compatible Brother DK-22205 White Paper Standard Continuous Labels without Reusable Cartridge - refill roll - order now! Brother Continuous Length Tape DK-22205 for Brother P-Touch QL 560 YX, Brother P-Touch QL 1000 Series, Brother P-Touch QL 720 NW and other machines - order now! 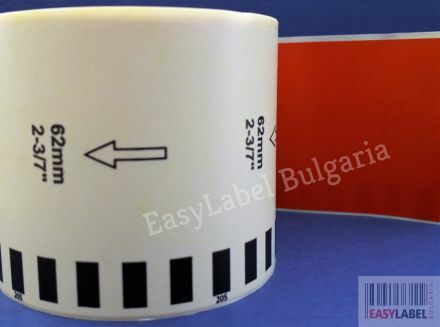 With this Brother DK endless label you can produce labels and markings of any length. Brother DK-22205 White Continuous Length Paper Tape 62mm x 30m, Black on White. Brother DK-22205 Compatible Labels - refill roll. Compatible Brother Tape dk-22205. Our compatible Brother DK-22205 labels have the same quality as the original Brother DK-22205 labels. 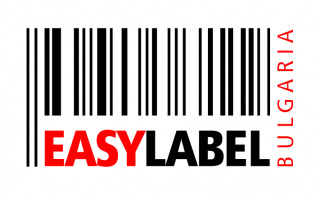 The only difference is that our Brother DK-22205 compatible labels are much cheaper. The Brother endless label (DK-22205) has a total length of 30.48m, is permanent adhesive and can be printed in any width. They can be used for many applications in the workplace, at home or for hobbies. Reliable adhesion, simple removal from backing material, universal use indoors. Can be used for marking files, letters, name tags, test tubes, storage places, shelves, and as price tags. Save money buy replacing just the roll of labels on brother QL series label printers. For use with Brother QL Series Label Printers. 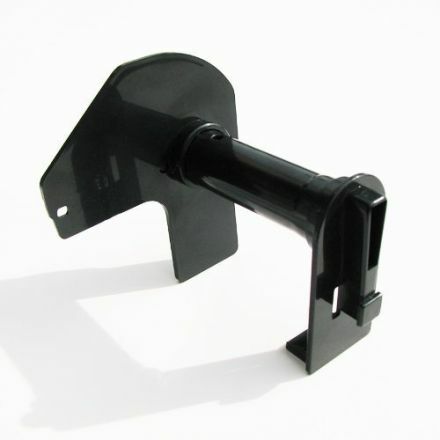 We have a standard range or can manufacture to suit your requirements. Brother DK-44605 Yellow Continuous Length Removable Paper Tape, 62mm x 30.48m, Black on Yellow for Brother P-Touch QL 560 YX, Brother P-Touch QL 1000 Series, Brother P-Touch QL 720 NW and other machines - order now! 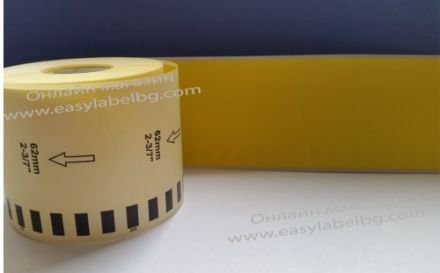 Brother DK-44605 White Continuous Length Paper Tape 62mm x 30.48m, Yellow on White. Brother DK-44605 Compatible Labels - refill roll. Our compatible Brother DK446005 labels have the same quality as the original Brother DK44605 labels. The only difference is that our Brother DK44605 compatible labels are much cheaper. The Brother endless label (DK 44605, DK-44605) has a total length of 30.48m, is removable adhesive and can be printed in any width. They can be used for many applications in the workplace, at home or for hobbies. Plastic oem rolls are ment to be throw out after use. Brother DK-2205 Red Continuous Length Removable Paper Tape, 62mm x 30.48m, Black on Red for Brother P-Touch QL 560 YX, Brother P-Touch QL 1000 Series, Brother P-Touch QL 720 NW and other machines - order now! 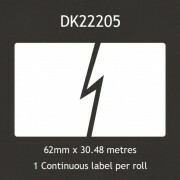 Brother DK-2205 Compatible Labels - refill roll. The Brother endless label has a total length of 30.48m, is removable adhesive and can be printed in any width. They can be used for many applications in the workplace, at home or for hobbies. Cheap Compatible Brother DK2205RN DK-22205 White Paper Standard Continuous Labels without Reusable Cartridge - refill roll - order now! Brother Continuous Length Tape DK-2205RN for Brother P-Touch QL 560 YX, Brother P-Touch QL 1000 Series, Brother P-Touch QL 720 NW and other machines - order now! 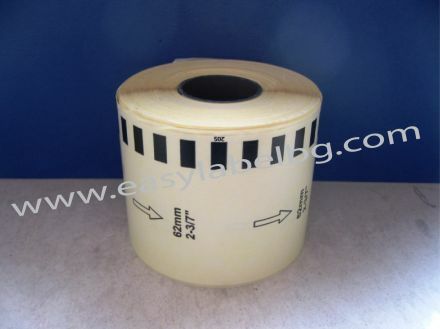 Brother DK-2205RN White Continuous Length Paper Tape 62mm x 30m, Black on White. 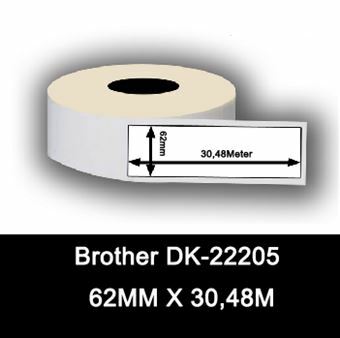 Brother DK-2205RN Compatible Labels - refill roll. Compatible Brother Tape dk-22205. Compatible for Printer: QL-1050, QL-1050N,QL-1060N,QL-500, QL-500A,QL-500BS, QL -500BW, QL-550, QL-560, QL-560VP,QL-570, QL-580N,QL-650TD,QL-700,QL-800,QL-710W,QL-720NW. Our compatible Brother DK-2205RN labels have the same quality as the original Brother DK-22205 labels. 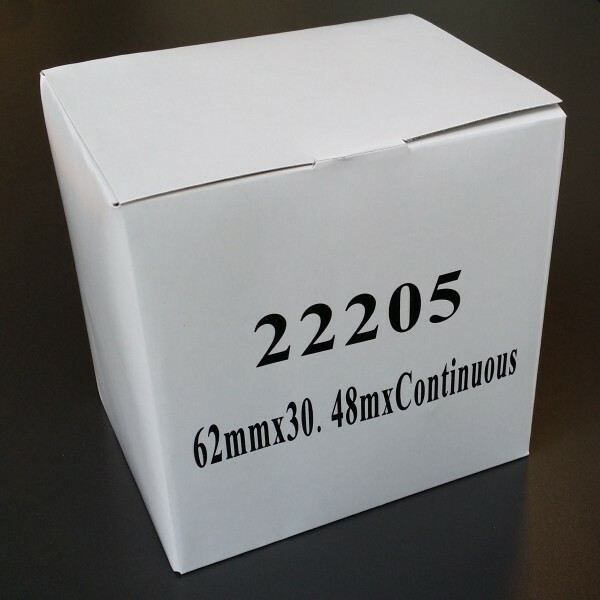 The only difference is that our Brother Brother DK-2205RN compatible labels are much cheaper. The Brother endless label (DK-2205RN) has a total length of 30m, is permanent adhesive and can be printed in any width. They can be used for many applications in the workplace, at home or for hobbies. Reusable label holder DK2205 for Brother DK-2205RN , Brother DK-2205(Red), Brother DK-44605(Yellow) and Brother DK-22205 compatible Labels. Suitable for the following compatible Brother labels: QL500, QL550, QL570, QL580N, QL650TD QL700, QL710w, QL720nw, QL1050, QL1060. Cost saving, you only need to order the holder once!